Blood transfusion is needed for surgery and other medical treatments. Constant supply of blood is vital to save lives and improve health. 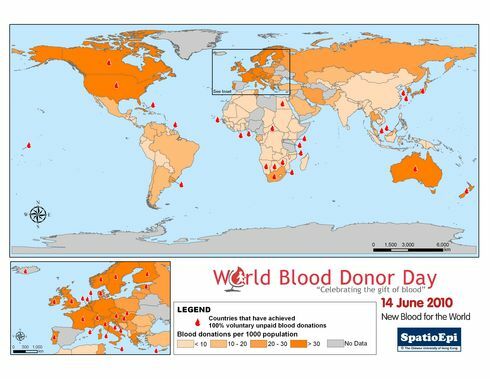 The map shows the availability of blood in each country, expressed as the number of blood donations per 1000 population. It is estimated that a country needs at least 10-30 donations per 1000 population every year for achieving self-sufficiency in blood supply. As depicted by graduated colours, blood donation in up to half of the countries is inadequate based on this estimation. The blood symbols indicate countries where 100% blood is supplied by voluntary unpaid donors, which is considered as a safer source of blood. This is achieved in <1/3 of the countries, half of which located in Europe. 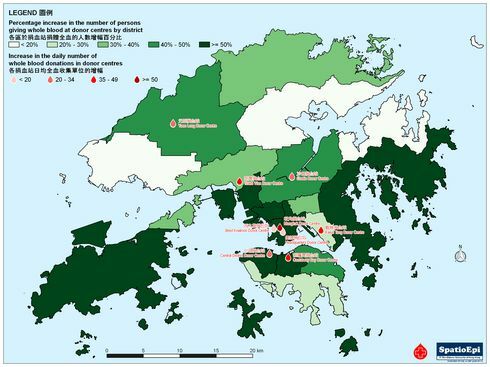 Data for this map were obtained from a World Health Organisation survey released in 2007.